There are two kinds of road trip mix cds. One is the fast, loud, drive very fast sort of mix, the kind with tons of noise and energy. Then there are the ones you listen to when you’re driving along on a dark highway under a full moon, feeling a bit more thoughtful about things, even sort of melancholy. I remember when I moved to Minnesota, and I was driving on a back highway through Montana, very late on a winter night (taking the shortcut to Belle Fourche so I could avoid most of Wyoming), and the moon was out, the clouds kept moving across the sky rapidly, a friend of mine was sleeping in the passenger seat, and my radio kept picking up ghosts of pop music broadcasts — most of which were playing George Michael’s “Father Figure” (which should date this trip pretty well for you, right there). I hated that song before, but the sound of it seemed to fit my mood. I was moving away from the only place I really knew, taking a gamble in moving to a new town with no job. So, over the years since then, I’ve made a few mixes that seem to match that late night melancholy road trip mood. Here’s one. It’s just slightly too long for a CD so I guess I’ll be playing it from my iPod. “This Modern Love” — Bloc Party; I don’t remember buying this but it was with my iTunes purchases. (Was it one of the free tracks?) Anyway, it seemed to fit into the flow of this mix. “Landed (Strings Version)” — Ben Folds; for the last year or so I have listened to this song over and over. It starts out like Elton John playing James Taylor’s “Fire and Rain” but it’s so much better than that could be. And the strings version — it should be overkill, but it’s perfect. “Only Living Boy in New York” — David Mead; a cover, of course. It blends perfectly into the final note of the previous song, and starts a little piano trilogy. “Can’t Help Falling in Love (Again)” — eels; another cover, only two minutes long and a simple gem of a recording. “…Baby One More Time” — Fountains of Wayne; another cover. “Mixtape” — Butch Walker; OK, here we get into the songs that a current 15 year old would probably love and would discover from the soundtrack of a WB show or something. This and the following two songs really have that feel. Very “high school drama.” But we all have these high school drama moments. “Bad Day” — Daniel Powter; yes, I know, I am ashamed. “Respected” — Howard Jones; as in, 2005-vintage HoJo. It’s filed under “Electronic” in iTunes but it’s basically the same old Howard Jones, with a good pop hook and synthsizers. Anyway, this song and the previous have one of the best segues ever; they blend together like one song. “Walter Reed” — Michael Penn; dear God, I love Michael Penn. Why is he not a household name? “Thunder Road (the live piano version from the 1987 box set)” — Bruce Springsteen; both of these last two seemed appropriate for the quieter parts of a road trip. Sorry for the condition of this photo. It was taken in a dimly lit room, with a bad camera, and damaged film. I did the best I could to enhance it. I just found the photo while cleaning house; it was taken in spring 1996. Tiger wandered nonchalantly into the room, then saw the rat and — ZING! both cat and rat disappeared into the other room. I walked into the living room, calling the cat, and Tiger came out from the bedroom… proudly bearing her rat trophy. Then she dropped it on the floor at my feet and I took this picture. 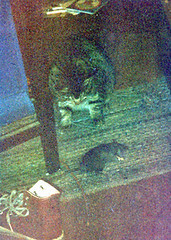 Tiger was a little 7 pound cat and this was a pretty big rat, though of course Tiger was still way bigger. Our rat problem went away. DO NOT MESS WITH THE TIGER.